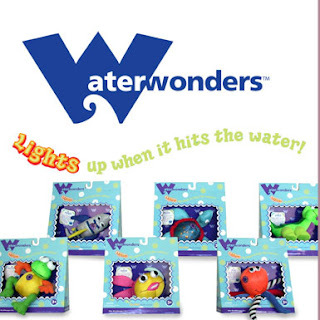 I was recently introduced to Waterwonders water toys from The Goldberger Company . My little one was sent Fernando the Frog , lets just say his reaction when he opened it was priceless...he loves frogs. I have found it very hard to find good water toys for the pool or tub for my toddler most toys are designed for children that are older. 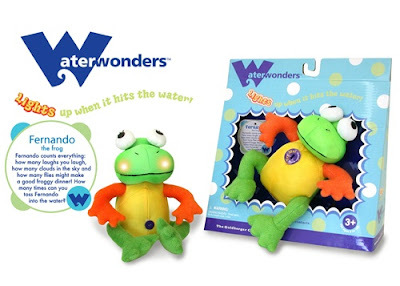 The unique thing about Waterwonders is that when put in the water and they light up and flash as soon as they’re wet! It is also designed to stop flashing after awhile, which helps with battery life which is a huge plus ! Bryce likes to play with Fernando the Frog in the tub and the pool but I have to say my favorite place for him to play with it is in the pool. When we go swimming Bryce is either in my arms or in a ring. Toys he normally plays with in the pool go straight to the bottom when he drops them but not Waterwonders , Fernando the Frog FLOATS !!! Which is great ! Bryce can grab him when dropped and mom is not worn out from retrieving toys all day ! Each character is individually named and has its own bio attached. Includes the Goldberger Lifetime Guarantee! Playthings that engage the mind, body and soul for children aged 0 to 3 years old and their parents. We create dolls and toys that are delightful, safe and fun, and are just as parent friendly as kid friendly – in their maintenance, their quality, and their value. Playthings for children in their earliest years help to shape how they grow and learn. The care and attention we put into our toys is returned tenfold by the ways they nourish and teach the children who play with them. How cool! Paige would LOVE these...the little alligator is adorable! How cute are these?!?! My girls would love them.